I’ve always wanted to travel. The idea of going to far-away places, meeting different kinds of people, experiencing different types of cultures has a certain appeal. I always say that if I got really rich, instead of acquiring material stuff like most people would do, the money for me would mean freedom to go anywhere I want to. Live a year in Brazil, 6 months in Nepal , 2 years in Egypt (may they get peace and stability soon). Different places, different people. Last year I finally decided to actually do some traveling rather than just fantasize about it. Even if it’s on a low-budget. So in December when my friend told me we should visit our other who lives in Dubai it was the perfect opportunity. The three of us have been friends since we were like 10. The friend who lives in Dubai has been asking us to visit her for a while but it’s never come through. So it was pretty exciting for us to finally get a chance for the three to hang out. At first we weren’t sure we’d make it this time either, and we almost cancelled a couple of times, but luckily we managed to get our stuff together and set the date for end of January. Due to logistics we ended up traveling on different dates with me travelling a day earlier and my other friend travelling the next day. My trip was uneventful, thank God. Since this was my very first time venturing beyond our East African borders I was a bit apprehensive and my mum gave me enough warnings of “”don’t help people with babies, they hide drugs in their diapers!’ My flight was for 1640 and I arrived at around 11.pm Dubai time. Dubai airport is pretty simple cos everything is clearly marked and I went through immigration ok, though the guys there were rather unfriendly. Guess they didn’t like working at that time of the night. But I was happy that I was out of the airport in a short time. I managed to get a taxi and direct it to where I was staying. 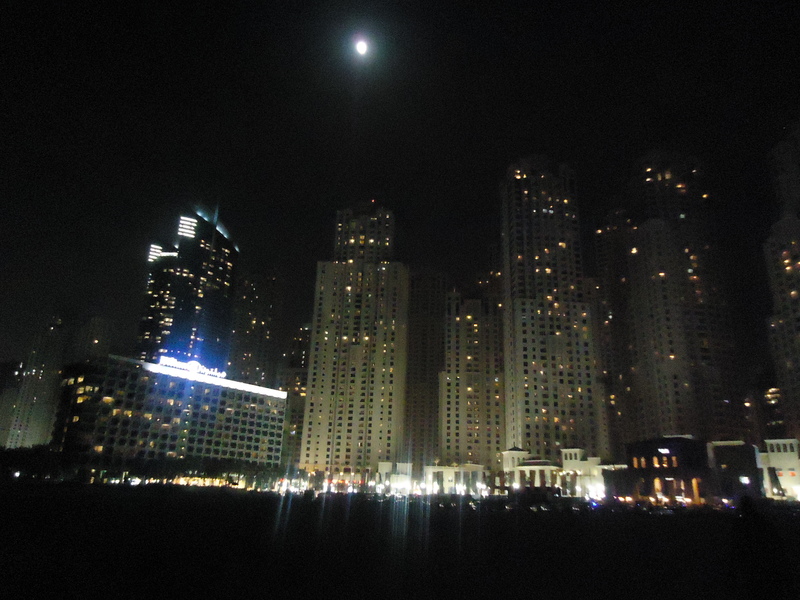 My first view of Dubai was at night and it was amazing. Lots of lit up sky scrapers decorated the skyline. The taxi managed to get me to my friend’s house with her giving directions. One thing I noticed is driving is complicated. If you miss a turning, you have to go quite a distance to get back on the right road. There’s no U-turning on random places and you can’t go up pavements. Someone said as much as fuel is cheap, they do a lot more driving for short distance. Oh, also the driver stopped at a red light at an empty road until it turned green. I imagined what our Kenyan drivers would have done. lol.But the roads are amazing. Super highways and complicated networks. Hopefully this is what the Chinese have in mind for our roads. I spent the first day doing some mild sight-seeing while waiting for my friend who was arriving at 2am. I feel asleep at around 9 and was woken up by her “We’re in Dubai” screams. She had arrived safely. Finally the 3 musketeers were reunited! 🙂 someone’s having fun I’m sure! hehehe. Nice. I cannot wait for confessions of a shopaholic. hihihi. Lol. well written, especially the “and I went through immigration ok, though the guys there were rather unfriendly.” We tend to test their patience cz the flights are the night flights so we’re usually tired. So we skip the whole “other countries” lines and take the “Gcc or Emirati” cues and then at the counter, they discover we are neither GCC citizens nor emiratis and some of them r respectiful cz of my mom, bt sometimes they turn all rude on us. I didn’t connect it to the time of work, I always thought it was because of what we did. Btw the no-u-turn thing is mostly in Dubai. Abu Dhabi is fine. You make a mistake, u can u-turn at the next stop.